In March 2014, changes to the Privacy Act 1988 came into effect to allow for this inclusion of extra information about your credit history in your credit file. The move across to CCR was originally optional and following limited take up by financial providers, in late 2017 the Australian government announced it was mandating CCR. The requirement is that licensed credit providers have at least 50% of their positive consumer credit data “ready for reporting” by the 1st of July 2018. They will then be required to have all of it ready a year later. The big banks and various credit providers will start to report CCR data throughout 2018 from February onwards. 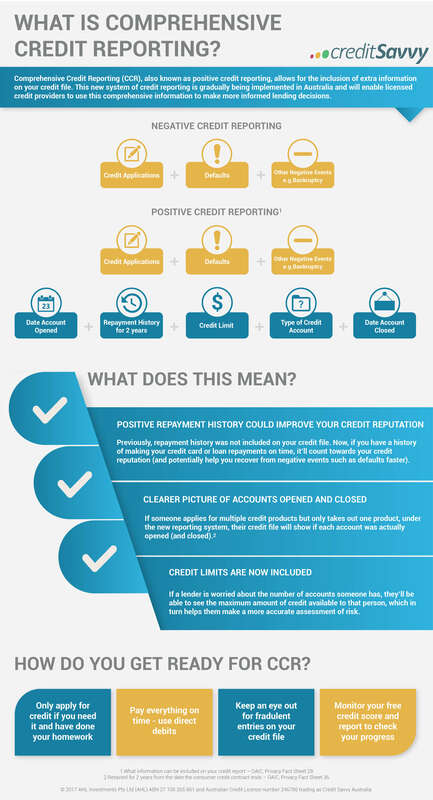 The new categories of information included in your credit file under Comprehensive Credit Reporting include repayment history information and consumer credit liability information. Your repayment history is stored on your credit file for two years. Only your repayment history from licenced credit providers who hold an Australian Credit Licence can be recorded. Telecommunication and utility companies are not licenced credit providers, so your repayment history will not include these providers and they will not be able to see repayment details either. Comprehensive Credit Reporting means that a more complete picture of an individual’s credit profile can be held on their credit file. People demonstrating good credit-based behaviour (such as repaying debt on time) will now see that reflected on their file and credit score. It will allow people to take greater control of how they can be perceived by potential lenders reviewing their credit file. It could allow people to recover more quickly from adverse situations or to establish a credit history more quickly. Ultimately, it could lead to improved access to credit for consumers and potentially at better rates. Risk-based pricing structures are common in other markets such as the United States, UK and New Zealand who already have this type of comprehensive credit reporting in place. For lenders and financial institutions, it should ultimately result in more informed lending decisions, leading to fewer outstanding debts and less defaults. It may also present the opportunity to develop new lending processes and product offers to market. As Comprehensive Credit Reporting is a voluntary opt-in system, it will take time for all lenders to switch across, so additional information may not appear on your credit file if your credit provider has chosen not to share this information with credit bureaus yet. You can contact your credit provider if you are unsure whether they have adopted Comprehensive Credit Reporting or if you want more information about their credit reporting practices. As more credit providers opt in to Comprehensive Credit Reporting, it has never been more important to stay on top of your finances.